What makes Putin so popular among the Russian population? For how long will he remain in power? What is his relationship with the kleptocrats who want to maintain their business contacts and luxury apartments in the West? 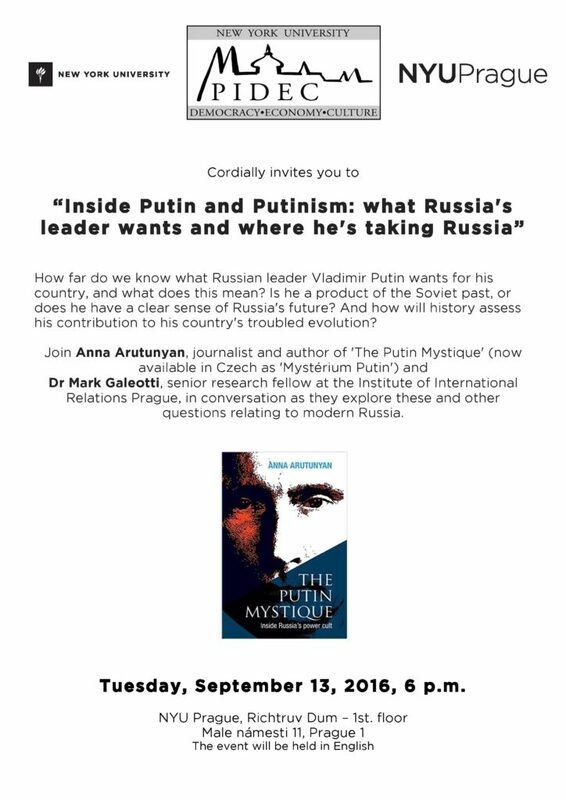 Anna Arutunyan, a Russian American who has worked as a journalist in Moscow since 2012, discussed these issues – and many more- with Mark Galleoti, expert on Russian security, at NYU Prague during a public discussion entitled Inside Putin and Putinism: What Russia’s Leader Wants and Where He’s Taking Russia. 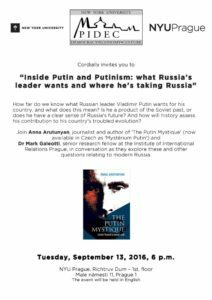 Arutunyan is the author of The Putin Mystique, a book published in 2015 that focuses on the Russian people why so many support Putin. According to the Wall Street Journal “This fascinating book is an examination of a dance between ruler and ruled, swirling on amid the ruins the Soviets left behind.” Arutunyan was born in the Soviet Union and grew up in the United States, and she is a graduate of the NYU Arthur L. Carter Journalism Institute. Ms. Arutunyan was joined for the discussion by Mark Galleoti, the former Clinical Professor of Global Affairs at NYU at the NYU Center for Global Affairs. He has recently moved to Prague as the senior research fellow at the Institute of International Affairs Prague. Galleoti argued that Russia is in a post-Imperial transition, pining its former Empire and defensive about its sovereignty – not unlike the UK. There are two Putins at odds with one another: the pragmatist who keeps the economy working, and the Putin who is concerned with his historical legacy, craving a glorious, sovereign Russia which has a strong voice in global issues. He taps into the population’s desire for the return of the Russian Empire, even when the size of the economy in the country today has shrunk the size of Spain’s. Hundreds of science enthusiasts had a blast on Saturday at NYU Shanghai by envisioning the future world with leading researchers from the most cutting-edge frontiers of life science and artificial intelligence. Organized by the Future Forum and NYU Shanghai, the 20th Future Science Lecture saw almost five hours of thought-provoking keynote addresses and panels among scientists, entrepreneurs and the audience. It was the first time that the forum moved to Shanghai following 19 successful sessions in Beijing. Jeffrey Lehman, Vice Chancellor of NYU Shanghai, hailed the forum as exemplary as it seeks to connect the world through science and technological innovation, which touches every aspect of our lives. “NYU Shanghai, as part of our mission, is designed to provide a venue where we can welcome people from different communities to convene with conversations over serious issues and develop new ideas,” Lehman said. In the first half of the lecture, William Haseltine, Chairman and President of ACCESS Health International, shared his insights on regenerative medicine and immunotherapy, describing them as “critical to the health of you and your loved ones”. According to Haseltine, regenerative medicine seeks to generate new tissues and organs within one human body, which will reset the tissue’s age and bring body functions back to a younger stage, while immunotherapy allows us to “use our immune system to find malignant tumors”. He called for increasing investment in the two fields to produce more technological breakthroughs. The second half of the lecture featured lively speeches over the history, nature and impacts of artificial intelligence. Yu Kai, Founder and CEO of Horizon Robotics, believed that AI will turn many of today’s user terminals into something truly “smart” and data-based. “From an entrepreneurial perspective, it can be the biggest industrial opportunity in the next 10-20 years,” Yu said. In particular, Zhang Zheng, Professor of Computer Science, and Jeffrey Erlich, Assistant Professor of Neuroscience at NYU Shanghai, joined the panel discussion over questions such as what changes AI will bring to our society in the next five years and their concerns about its expansion. “As a citizen, I’m excited about real-time translation: something that people can wear which will allow them to talk to anyone,” said Professor Erlich. “Considering different cultures and global security, allowing one individual on the planet to talk to another in real-time will bring enormous benefit,” he added. This post comes to us from NYU Shanghai; the original is available here. On Thursday, 22 September, the NYU Brademas Center at NYU Washington, DC will celebrate Constitution Day, an American federal observance that recognizes the adoption of the United States Constitution. Stephen D. Solomon, associate director of the Arthur L. Carter Journalism Institute of NYU and director of the M.A. program in Business and Economic Reporting, will provide a dialogue on his newest book, Revolutionary Dissent: How the Founding Generation Created the Freedom of Speech. Stephen D. Solomon is associate director of the Arthur L. Carter Journalism Institute and director of the M.A. program in Business and Economic Reporting, which he founded in 1999. His new book, Revolutionary Dissent: How the Founding Generation Created the Freedom of Speech, was published by St. Martin’s Press in April 2016. It explores how the raucous political protest of the nation’s founding period gave meaning to the freedoms of speech and press at a time when the crime of seditious libel was used to punish criticism of government. Steve received his B.A. degree from Pennsylvania State University and his J.D. from Georgetown University Law Center. In addition to business journalism, he teaches graduate and undergraduate courses on the First Amendment. He was awarded NYU’s Golden Dozen Award for excellence in teaching.His last book,Ellery’s Protest: How One Young Man Defied Tradition and Sparked the Battle Over School Prayer, explores the landmark 1963 case (Abington School District v. Schempp) in which the U.S. Supreme Court ruled that state-sponsored prayer and Bible reading in the public schools violated the religious liberty protected by the First Amendment. The case still inflames passions today as Americans debate what role, if any, that religion, prayer, creationism, intelligent design, and the Ten Commandments should play in the public schools. 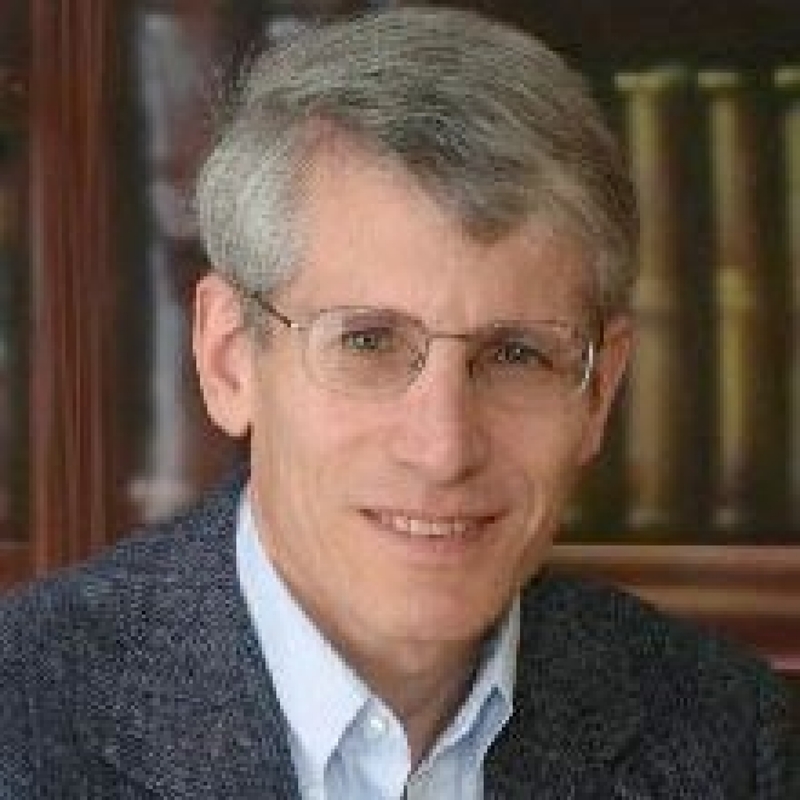 Steve was a writer at Fortune magazine and has written for many other national publications including The Wall Street Journal, The New York Times Magazine, The New York Times Book Review, and Inc. His articles have won the two most prestigious awards for business writing, the Gerald Loeb Award and the John Hancock Award for Excellence, as well as the Hillman Prize. He is also co-author of Building 6: The Tragedy at Bridesburg, an investigation of the working conditions that caused the deaths of 54 men from respiratory cancer at Rohm and Haas, at the time a Fortune 500 chemical company in Philadelphia. The revelations in the book led to legal action by victims’ families against the company, and they received a multi-million dollar settlement. When members of the founding generation protested against British authority, debated separation, and then ratified the Constitution, they formed the American political character we know today—raucous, intemperate, and often mean-spirited. Revolutionary Dissent brings alive a world of colorful and stormy protests that included effigies, pamphlets, songs, sermons, cartoons, letters and liberty trees. Solomon explores through a series of chronological narratives how Americans of the Revolutionary period employed robust speech against the British and against each other. Uninhibited dissent provided a distinctly American meaning to the First Amendment’s guarantees of freedom of speech and press at a time when the legal doctrine inherited from England allowed prosecutions of those who criticized government. Solomon discovers the wellspring in our revolutionary past for today’s satirists like Jon Stewart and Stephen Colbert, pundits like Rush Limbaugh and Keith Olbermann, and protests like flag burning and street demonstrations. From the inflammatory engravings of Paul Revere, the political theater of Alexander McDougall, the liberty tree protests of Ebenezer McIntosh and the oratory of Patrick Henry, Solomon shares the stories of the dissenters who created the American idea of the liberty of thought. 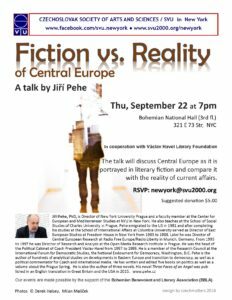 Posted in Faculty, Washington D.C.
Jiří Pehe, Director of NYU Prague, will give a talk entitled “Fiction vs. 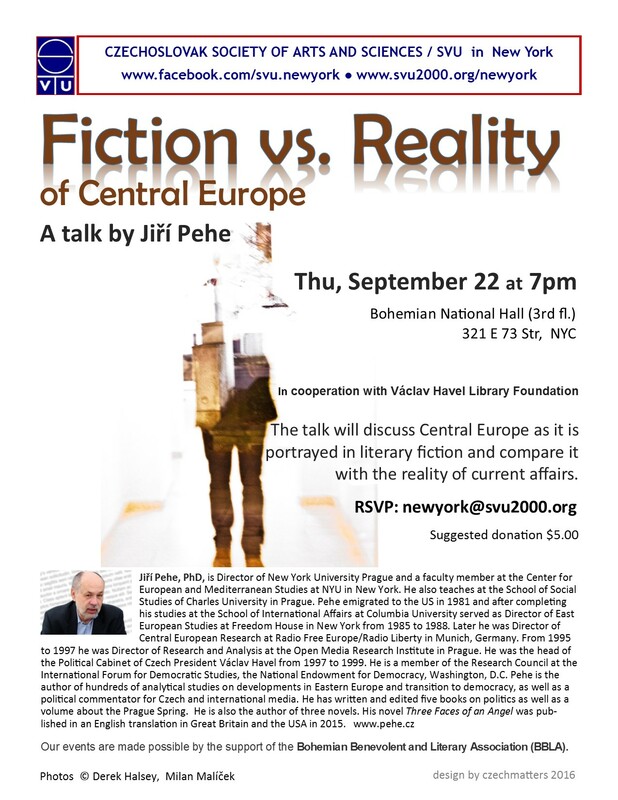 Reality of Central Europe” on Thursday 22, September at 7 pm at the Bohemian National Hall in New York City. The talk will discuss Central Europe as it is portrayed in literary fiction and compare it with the reality of current affairs. 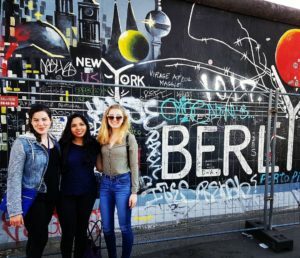 Anna with friends visiting from NYU London at the Berlin Wall. 1. What is your school affiliation and what year are you? What is your major? 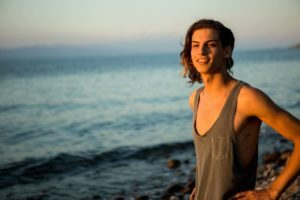 I am a rising senior at NYU in the Global Liberal Studies school. I am set to graduate in the spring of 2017. I am a Global Liberal Studies major concentrating in Politics, Rights, and Development. I also have declared a double major in German language. 2. What inspired you to study in Berlin? It was multiple reasons. I already had some good German language experience as I attended Kindergarden in Basel, Switzerland (German speaking part of Switzerland). I also loved that Berlin was located very centrally in Europe. This would allow me to meet people from all over the continent and allow for easier travel to other countries. The biggest inspiration for my choice was the current world refugee crisis. I had been reading reports on Germany’s record breaking in take of people in need and was fascinated by how they were able to accomplish this where other countries shied away from the challenge (The US included). 3. How was your experience? What was most inspiring, surprising, or moving about your time there? What did you find challenging? The experience cannot be described as anything short of incredible. I owe a big thank you to the truly amazing NYU Berlin staff and professors. They really take into account an individual students interested and go out of their way to connect you with resources in and around Berlin. It was surprising to see how different and yet similar it was to NYC. You have the same melting pot of people aspect and your surrounded by amazing art and culture. However, it feels a bit more relaxed and slower than NYC. People take their time and sit out side at cafes for coffee rather than running around with Starbucks to-go cups! I had a very moving experience with the family of a close friend. He was German-Polish and his family essentially adopted me for the year allowing me to do laundry at their home as well as never letting me leave without a full bag of groceries from their grocery store in Poland. I even went with them one weekend in January to visit their family farm in Jutrosin (6 hour car ride from Berlin). That was my first contact with the Berlin migrant community. The most challenging aspect was trying to adjust to the framework of the EU political system. I had always had an interest in human rights but had really only approached in in previous classes from a US perspective. My first months in Berlin I was overwhelmed with the dynamics involved in EU legislation and how various member states worked together to address humanitarian issues and crisis. 4. I understand that you worked with an organization, FreeArtus: Artists and Refugees United for Freedom, while in Berlin during your second semester in Berlin (Spring, 2016). How did you come to intern with FreeArtus? What did the work involve? I came to work for FREEARTUS artists and refugees united for freedom as part of my coursework. For Global Liberal Studies majors we perform an internship in the second semester of our junior year in our study abroad site. 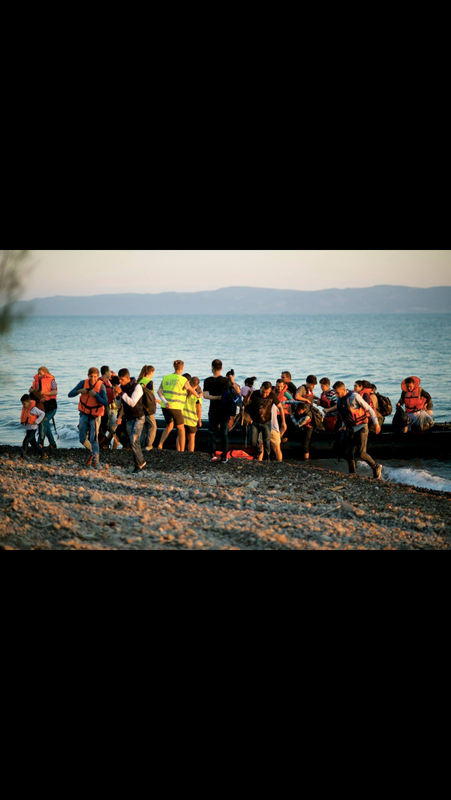 I had expressed interest in working in some capacity with the many refugees that were flooding in to the city. The work involved research for fundraising opportunities, event planning and executing, some light translation work, writing grant proposals, and special project monitoring. FREEARTUS has many wonderful programs that bring together refugees and Berlin artists through the universal language of the arts. I was able to sit in on meetings with the German government as well as aid first hand in the implementation of integration programs. 5. Do you feel as though the work you did as an intern was valuable and did you see its impact? Did the experience change your understanding of issues of migration, integration, and community? If so, can you describe how? I felt that the work I was doing was incredibly powerful. We would see newcomers come to a workshop, such as our acting workshop, and really be able to express themselves, despite not speaking perfect German or English. It was a place where they could be heard and not judged. The key to the program is that it was ‘for and with refugees’. Frank Alva Buecheler, one of the CEOs would always take in to account what the newcomers were asking for and made sure their needs would always be heard. He was an excellent supervisor because he really showed me what it looked like to go over and beyond for people in need. One evening I went with Herr Buecheler and one of our newcomers to a meeting with Amnesty International to try and locate a friend of his who had gone missing along the refugee route. 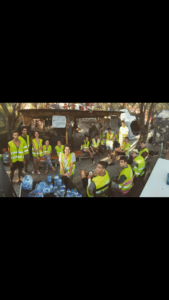 It was not part of one of FREEARTUS’ integration programs, it was just a small gesture of compassion and solidarity with one of our program’s users. Integration is a two way street. I realised that you cannot expect all the work and effort to come from new comers. Members of established communities have a responsibility and even the privilege of meeting these people half way and showing that they are supported, respected, and cared for. 6. Did you feel as thought the NYU Berlin community was generally aware of or engaged in thinking about the refugee crisis? The NYU Berlin community was very engaged in thinking about the refugee crisis. Various students would lead volunteer groups to play soccer with refugee children or help out in other small ways. The NYU Berlin housing staff set up a clothing/food drive at the end of the semester to use anything students wanted to part with at the end of the semester before they returned home. I had a lovely conversation with Gabriella Etmektsoglou, Director of NYU Berlin, shortly before leaving Berlin about the work that NYU Berlin has been doing with teachers in order to support refugees. I would say that the NYU Berlin community is discreet in their support for refugees but strong. They realise the value and potential that each of these people has just as they value the potential of all of their students. 6. I also understand that this summer you interned in Washington, DC at the CWS Immigration and Refugee Advocacy Program. Can you describe the work involved? Did your experience in Berlin inspire you to continue working on issues involving refugee? This policy internship threw me right back into the the American political system and forced me to brush up on my government knowledge! I assist in tracking state and federal legislation that is or might be anti-migrant. When a bill is detected our branch formulates action alerts and sign on letters in order to stop the bill in its tracks and hopefully keep it from being adopted into law. 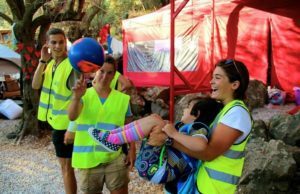 CWS is also one of the six resettlement agencies that the United States government uses to resettle all refugees in the United States. I have met some of the most hardworking and inspiring colleagues at this organisation and truly aspire to have their moral and dedication to this humanitarian cause. My experience in Berlin defiantly inspired me to continue working on refugee issues. The global climate demands a better response to the 60 million people around the globe that are displaced because of persecution. Working first hand with refugees in Berlin really grounded me and made me connect with people on a human level. It is on this level that it really hits you that these are people just like your friends or neighbours. 7. How would you compare these two internship experiences and what do you feel you’ve gained from each? The FREEARTUS internship was much more hands on and on the ground work. The CWS internship is totally in the policy world and research realm. 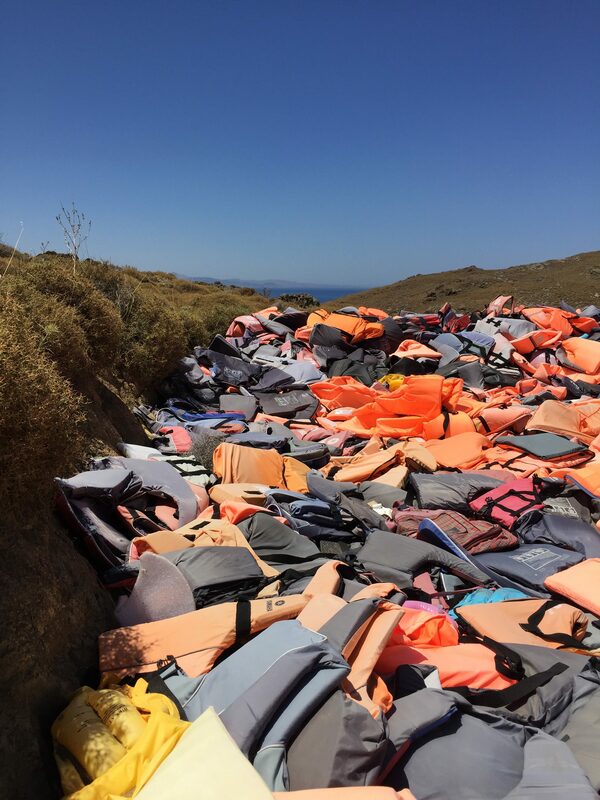 It all worked out perfectly for me because I really have a great perspective on policy because I had the opportunity to work on the ground with refugees. Hearing staring from the source what could be changed or improved is incredibly powerful. 8. Have these experiences informed your thinking about your future plans? If so, how? My experiences have greatly informed what I want to do with my future. I am currently in the process of studying for the LSAT and think of which law schools to apply to. I would love to steer my law studies toward international human rights. Hopefully one day I will be able to work for an organisation such as UNHCR, US Department of State, or a non-governmental organisation dealing with human rights. 9. 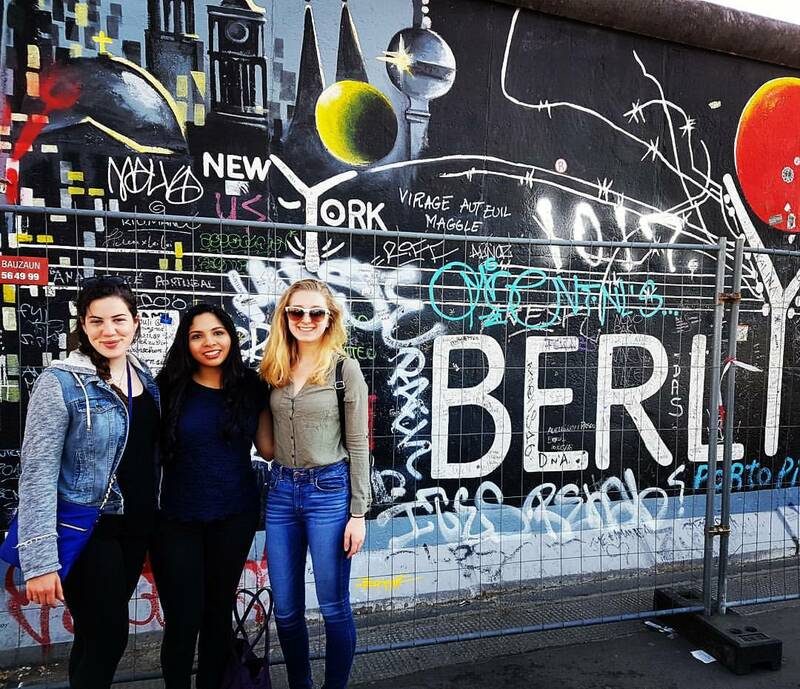 Is there anything else you’d like to share about your time in Berlin or while at NYU? My time in Berlin has been the most valuable and enriching experience of my undergraduate education so far. I look forward to one day returning to Berlin while pursuing my work in human rights. 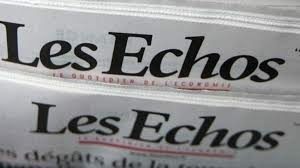 A recent article in Les Echos, a financial newspaper published in France, covered the creative writing program at NYU Paris which it described very favorably. The article (in French) is available here: http://www.lesechos.fr/week-end/perso/developpement-personnel/0211263727398-apprends-moi-a-devenir-ecrivain-2026118.php. Five NYU Shanghai undergraduate students have had their Computer Science research papers accepted by prestigious international conferences. Class of ‘17 students Che (Watcher) Wang, Yanqiu (Autumn) Wu, Carson Nemelka, Cameron Ballard and Kelvin Liu have been invited to present their papers at the highly competitive Annual AAAI Conference in San Francisco, the ACM Internet Measurement Conference in Santa Monica, and the International World Wide Web Conference in Florence, Italy, which have acceptance rates between 14% and 25%. The research, co-authored with academics at New York University and NYU Shanghai, investigates novice AI planning algorithms in real-time strategy games, the vulnerability of anonymous social media platforms, and risks to children’s privacy online. The evolutionary algorithm, Wang says, is “based on and inspired by natural selection” and was test-proven to outperform previous methods in a combat simulator for Blizzard Entertainment’s StarCraft game. “I was inspired by my advanced course called AI in Games. I only had a little over one year’s experience in programming before I got AI, but now I plan on taking on a DURF project this summer with a focus on reinforcement learning,” said Wang. The paper has been accepted for oral presentation in The Twelfth Annual AAAI Conference on Artificial Intelligence and Interactive Digital Entertainment (AIIDE-16) this October. Popular on college campuses, Yik Yak is an app that lets users post anonymous short messages — a “yak”– which can be seen by other users in the vicinity. However, anonymous social network services like Yik Yak 4chan and Whisper, are likely to come under scrutiny after the publication of You Can Yak but You Can’t Hide: Localizing Anonymous Social Network Users [pdf] by seniors Ballard, Liu, Nemelka, and Wu. Ballard worked with Nemelka on collecting data for the project. One of their experiments was able to determine the correct dorm out of nine UC Santa Cruz dorms from where a ‘yak’ message was generated — proven with 100% accuracy each time. Reflecting on the collaboration, Ballard said it had taught him how to better communicate his work: “When collaborating you have to make sure another person can pick up your work wherever you left off. For Carson [Nemelka] and I, that meant making our programs easily usable by the other members of the team who weren’t necessarily as versed in computer programming,” he said. The group’s paper has been accepted by the 2016 ACM Internet Measurement Conference (IMC), which takes place in Santa Monica, California, in November. The vulnerability of online privacy was also the subject of research published by Liu and Ross, along with NYU Tandon’s Tehila Minkus, in February 2015. Children Seen But Not Heard: When Parents Compromise Children’s Online Privacy exposed the risks of adults sharing children’s personally identifiable information on platforms like Facebook and Instagram and was accepted by the 24th World Wide Web Consortium 2015 (WWW’2015) in Florence, Italy. Read more here. Professor Keith Ross said he was proud of the students’ achievements. This post appeared in the NYU Shanghai Gazette, available here. NYU Abu Dhabi science student Nada Al Bedwawi is making a splash in the history books as the UAE’s first female swimmer to compete at an Olympic Games. Al Bedwawi — who also carried the country’s flag at the opening ceremony — was selected as a wildcard entry for the 50 meter freestyle event in Rio de Janerio, Brazil. It was an unexpected opportunity, she said, because her original plan was to compete at the 2020 Summer Games in Tokyo. “It’s an honor for me to be the first Emirati girl to represent the UAE in the swimming event and I hope more will follow,” said the 18-year-old who grew up in Dubai and is studying biology and math at NYUAD. We caught up with Al Bedwawi to ask about her goals at Rio 2016 and to find out what it’s like to prepare for exams and the world’s biggest athletic competition at the same time. How do you juggle school and training for the Olympics? Time management is the key to success, in my opinion. I set a detailed schedule to make time for everything from swimming to studying to relaxing and taking time off from my daily activities. I wake up around 7am to go running for 30 minutes. Then I head for breakfast and attend my first class. Between classes I eat lunch and study a little then go to swimming practice for 2-3 hours. Finally, I head to my room and relax before I start doing my homework and study for any tests I might have. What helps you relieve the stress of being a student and Olympic athlete? Hanging out with friends and watching TV shows. How does being a competitive athlete help you succeed in the classroom? It helps a lot with time management. I set a time for everything. What are your goals at Rio 2016? To represent my country in the best way possible and hopefully open doors for young Emirati female athletes who are really passionate about sports whether it be swimming, archery, track and field or whatever. It’s an honor for me to be the first Emirati girl to represent the UAE at the swimming Olympics and I hope more will follow. I am hoping to represent the UAE again in four years at the Tokyo Olympics.